Today, 23rd August, marks the centenary of the death in the First World War of the first person from Cork, Cloyne and Ross. He was William Regan from Charleville, County Cork. He was a Private in the Princess Victoria’s (Royal Irish Fusiliers ) (Regimental Number 8981). His military record indicates that he was killed in action. No further information is available about him. If any descendant or surviving family member has a photo of him or additional information the Bishop of Cork and Dean of Cork would like to hear from them for their World War I memorial project at the Cathedral: click here. Each month, during the coming centenary years, the names of those from Cork, Cloyne and Ross who died in the First World War will be posted adjacent to the War Memorial in St Fin Barre’s Cathedral, Cork and on the particular centenary dates the people will be commemorated at the daily Eucharist. 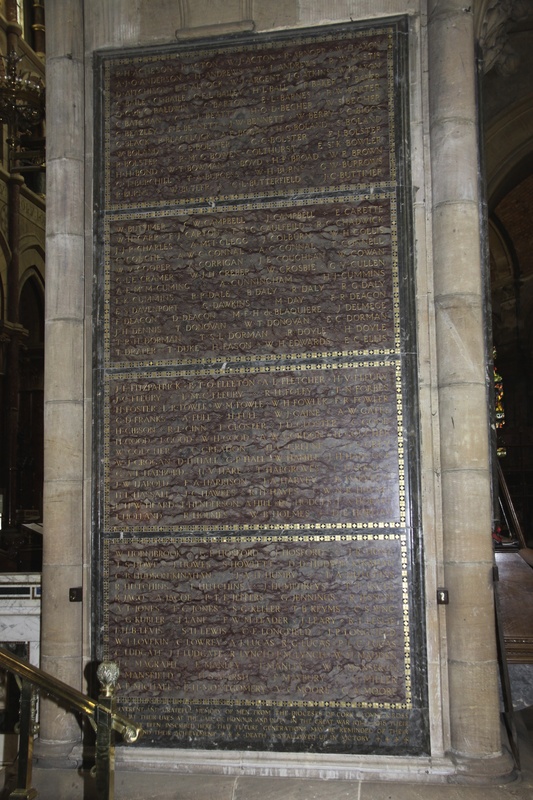 A full list of the names on the Cork, Cloyne and Ross diocesan memorial in St Fin Barre’s Cathedra; s available here. This entry was posted in Cathedral, Cork, Decade of Centenaries, Diocese. Bookmark the permalink.